While I was QuiltWest convenor, I was in the habit of accumulating lots of notes and messages on an assortment of various pieces of scrap paper which I inevitably misplaced. Two years ago I came upon the idea of making a cover for an A5 notebook so I could keep my messages together. I carry this journal with me everywhere and it serves the purpose it was made for. As you can imagine it has become very grubby with 2 years use. I have decided to make a new cover and have written a short tutorial for you to follow. 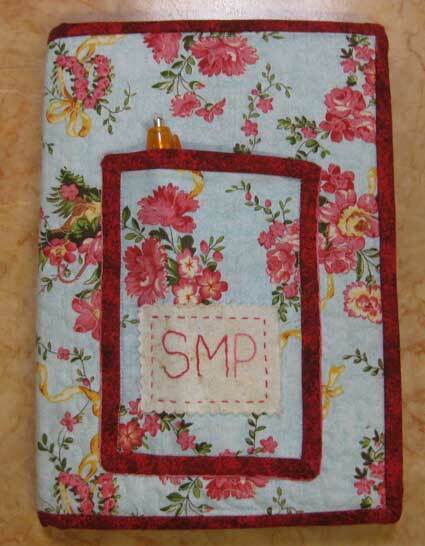 The tutorial is for a cover with a pocket, if you do not want a pocket omit this step. 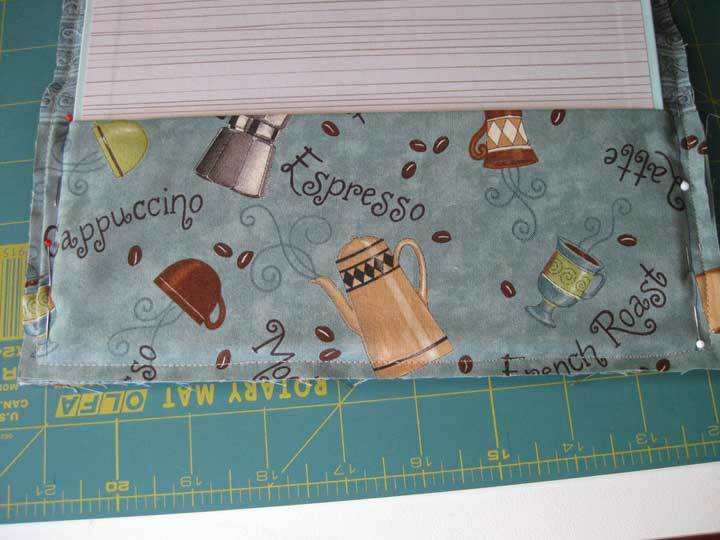 I used 2 fat quarters, plus 2″ strips of fabric cut the width of the fabric for the binding. Fabric width was 42″. I also used a contrasting fabric for my outside pocket and inside flaps from my scrap basket. This is my fabric selection. 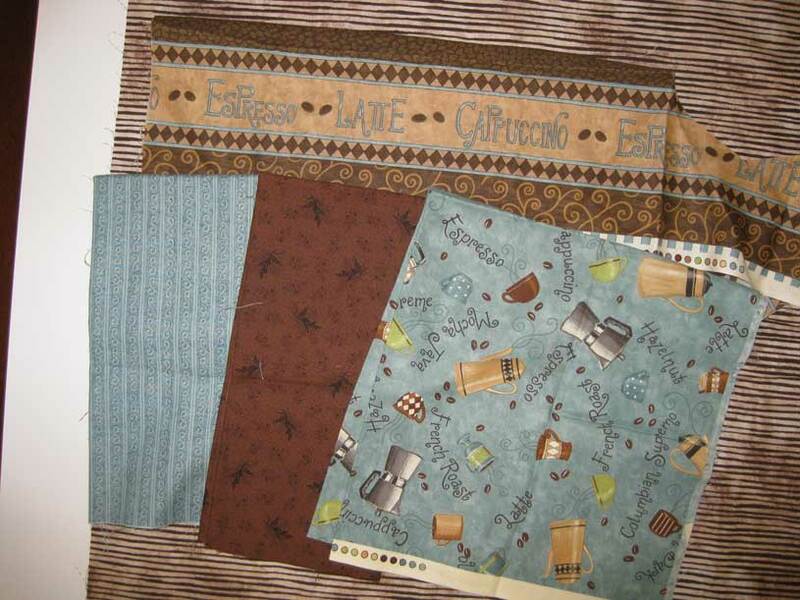 Lay the open A5 book on the fabric you have chosen for the outside cover. 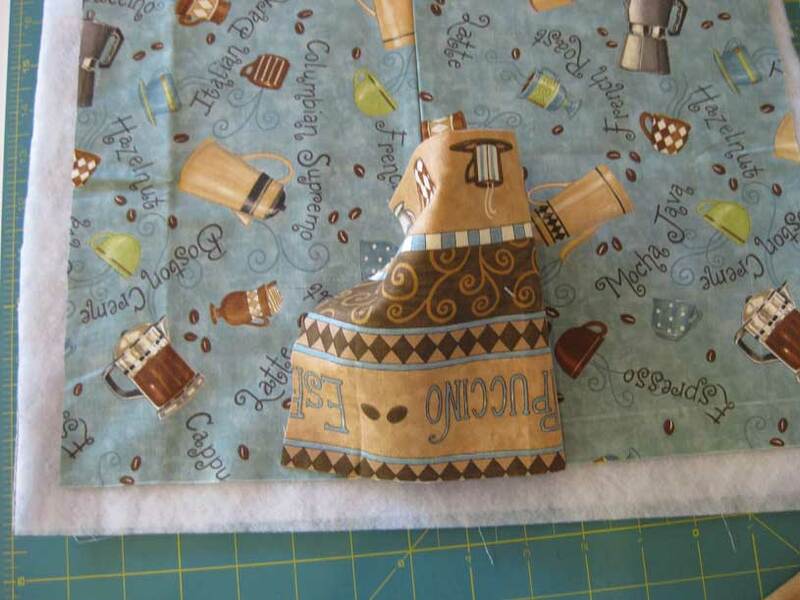 I have chosen the fabric with the blue background featuring coffee pots and mugs on it as my cover fabric. 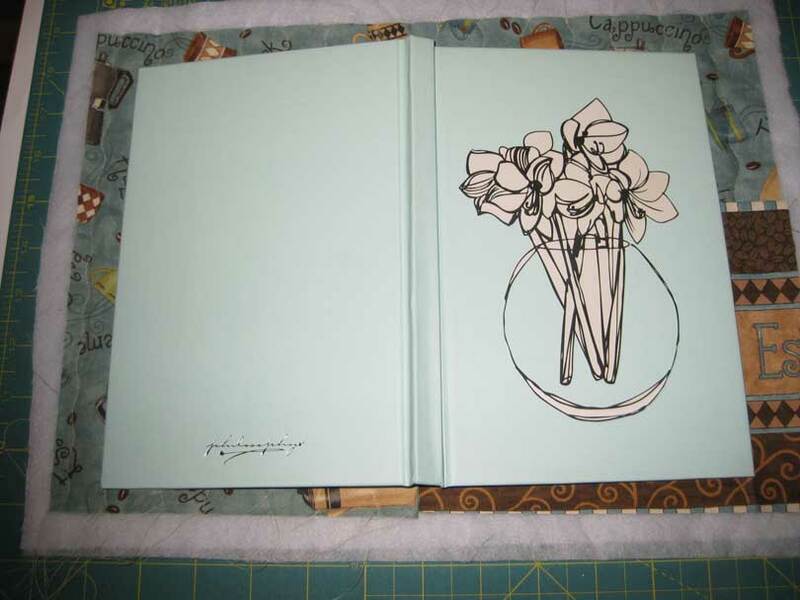 Trim the cover fabric so it 1″ larger on the top and bottom edges of the book and 1¼” on each of the sides – this is to allow for the insertion of the pocket on the front cover. Decide on what size pocket you would like and fold the fabric in half wrong sides together and cut to size. To insert the pocket into the cover you will need to cut the fabric in half and place the pocket between the 2 cover pieces and then stitch the pocket in using a ¼” seam allowance. Your outer cover should now look similar to the photo above. 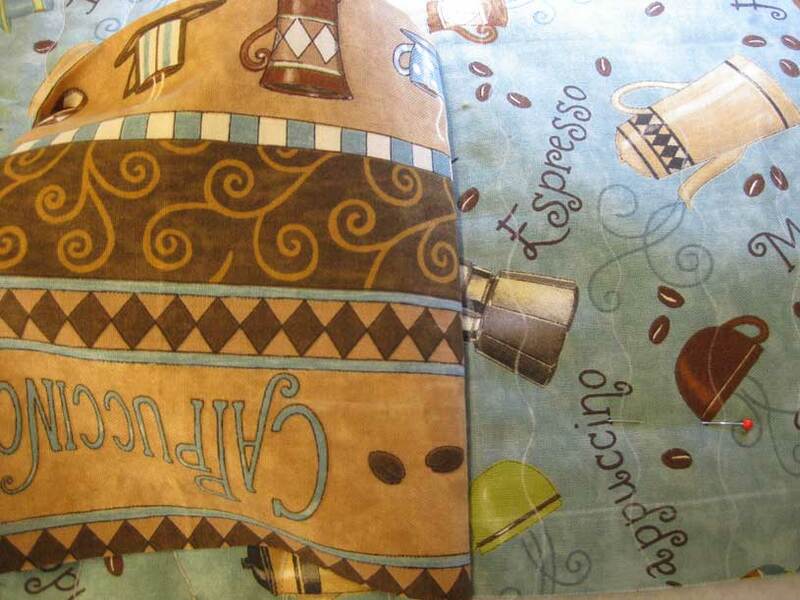 Cut a piece of thin wadding and backing fabric 1″ larger on all sides than your outer cover. 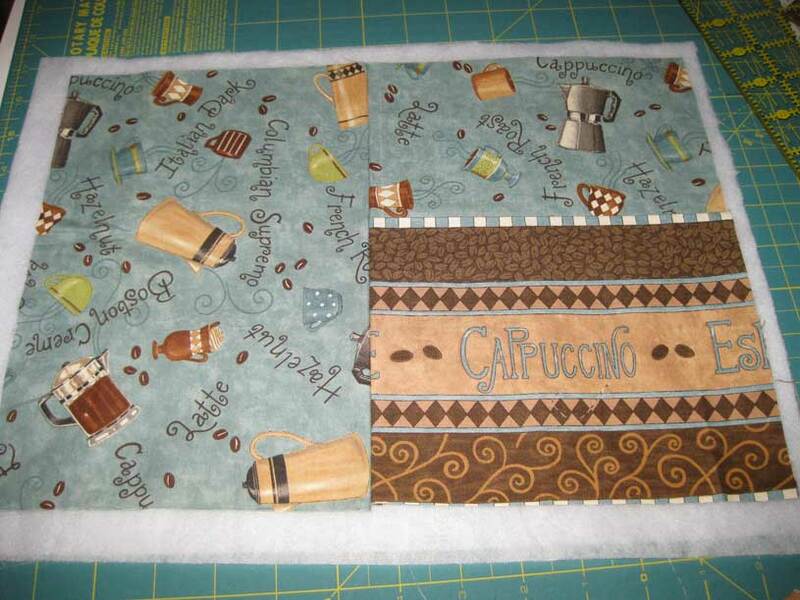 Position the outer cover on this and pin ready for quilting leaving the pocket loose. 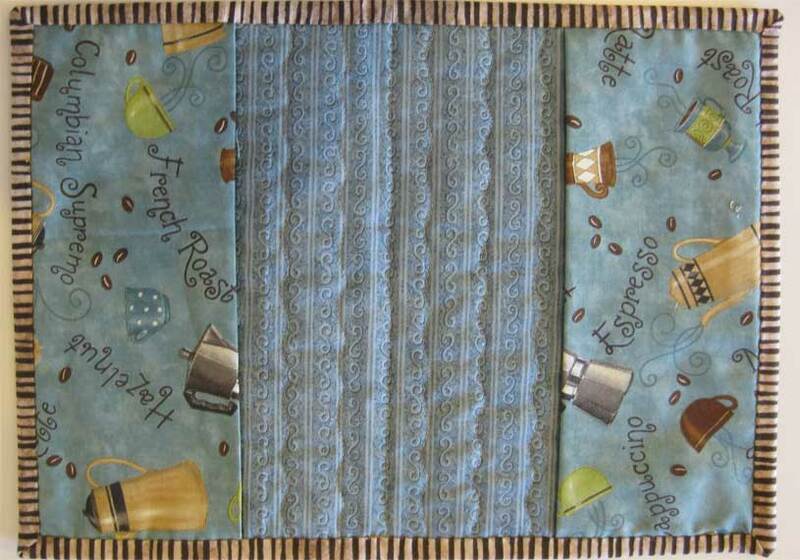 Quilt the 3 layers together using any quilting design you wish. 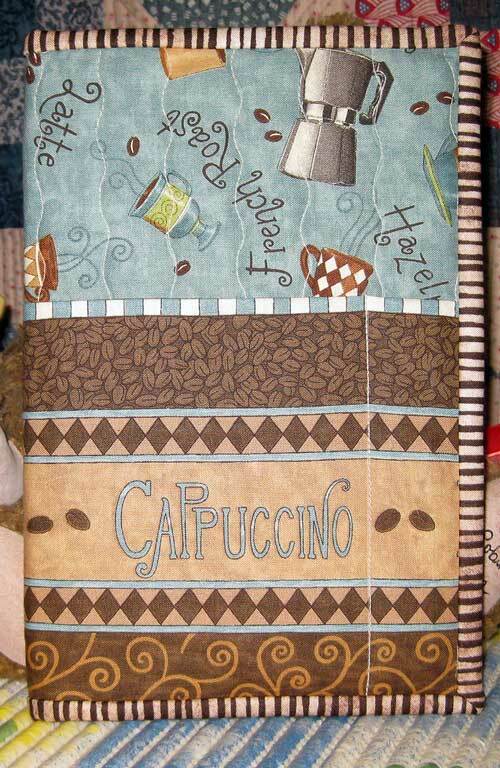 Push the pocket to one side and quilt one side of the book cover. The first side of the cover is nearly finished in the photo above. 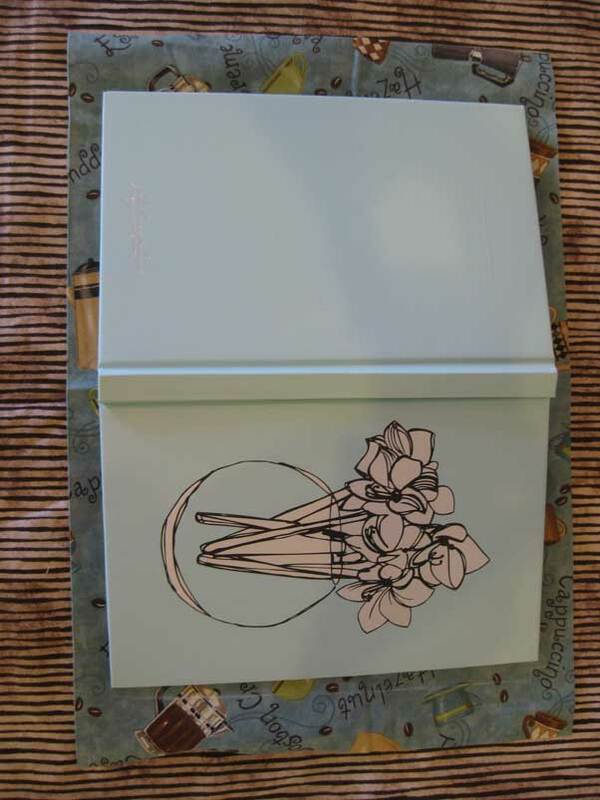 Push the pocket to the other side of the cover as shown in the photo above and quilt the second half of the book cover. 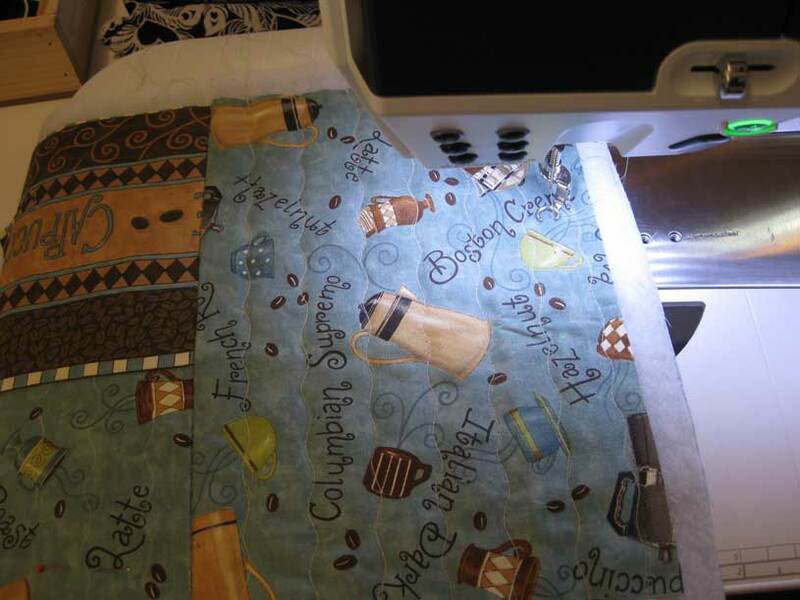 Once the quilting is completed the book cover will need cutting back to size. 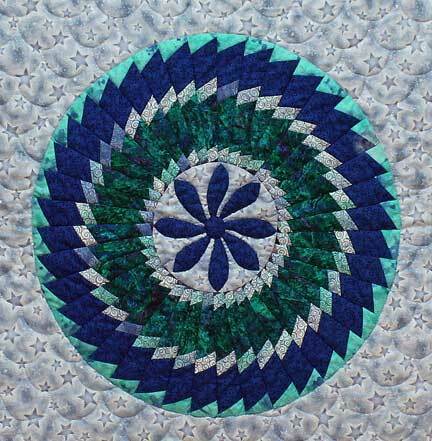 Place the open A5 book on the quilted piece so that you can estimate what size to cut. I allowed ¾” extra on all sides when I trimmed the cover back. Once you have cut the quilted cover to size measure its’ height. This will enable you to cut the flaps for the inside cover. The height of my book cover was 9¾”. I cut 2 pieces of fabric 9¾” x 7½” for my flaps. Fold these pieces of fabric in half lengthways with wrong sides together and press. Position the flaps on the inside of your book cover as shown and stitch into place along the outer edges with a scant ¼” seam allowance. Now is the time to check the book fits snugly into the inside flaps. Insert the book into the flap as shown above and pin along the top, bottom and side edges to ensure a snug fit, don’t make it too tight. 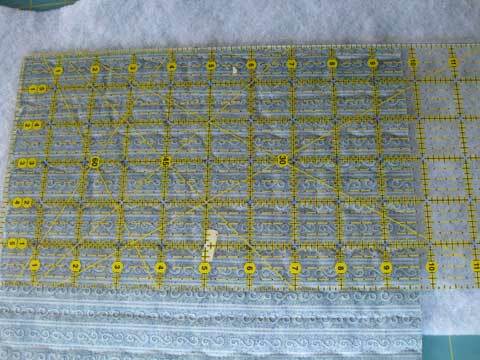 Stitch along the lines where you positioned the pins. Do one final check to make sure the book fits into the cover properly before doing a final trim. 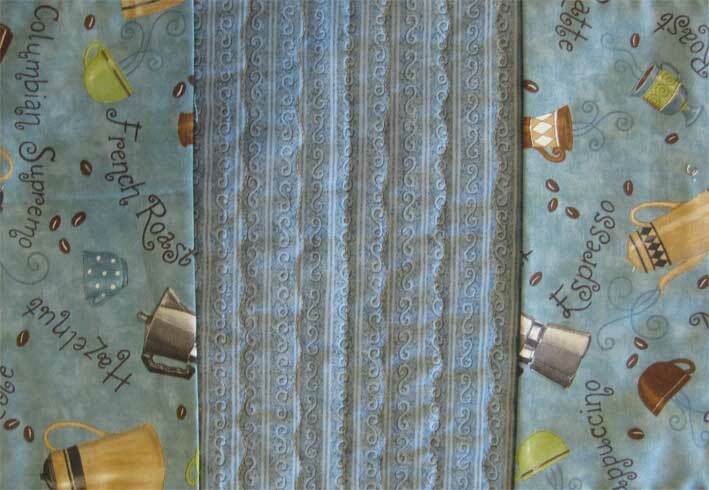 Cut a ¼” seam allowance from the line you just stitched on all sides. 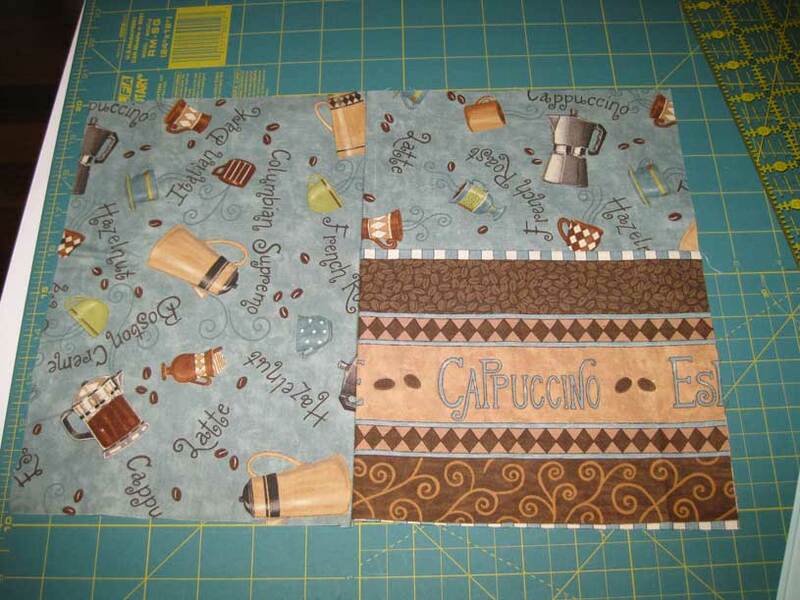 Join the 2 strips that you have cut for the binding. Fold in half lengthways and press. Bind the book cover with the strips you just cut. The book cover is now finished ready for you to use. I can fit my phone and a pen into the front pocket of the finished cover.